Ann has always loved senior greyhounds and especially broods. After Kiowa Jaimie Lynn came to town Anne fostered her and fell in love. Her new life starts with a new home in Amelia and a new name of Honey. 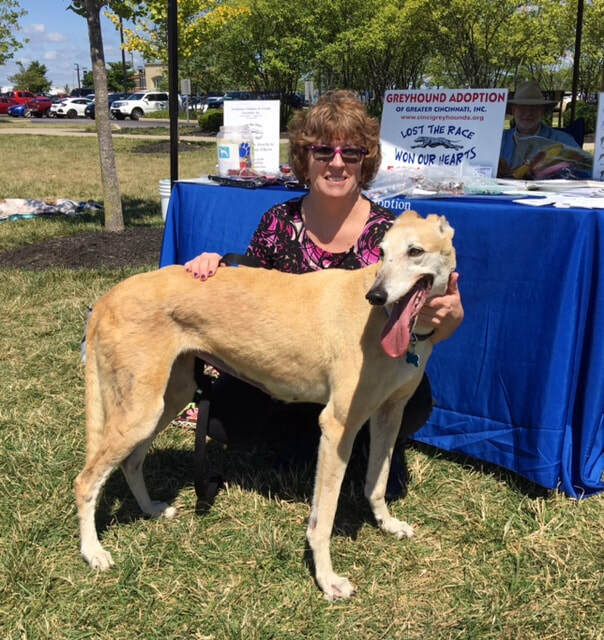 She is 9 years old and will definitely enjoy the BEST years of her life with Anne and her son Ethan (not pictured) This adoption was at the WC Farmer's Market and had a special meaning to Ann. That is where she adopted her last greyhound, Mac (who she recently lost) She is a VERY lucky girl now being spoiled and loved like she deserves.